At United Against Sexual Violence, we introduce you to allies who use their privileged positions to help create a fair, free world. 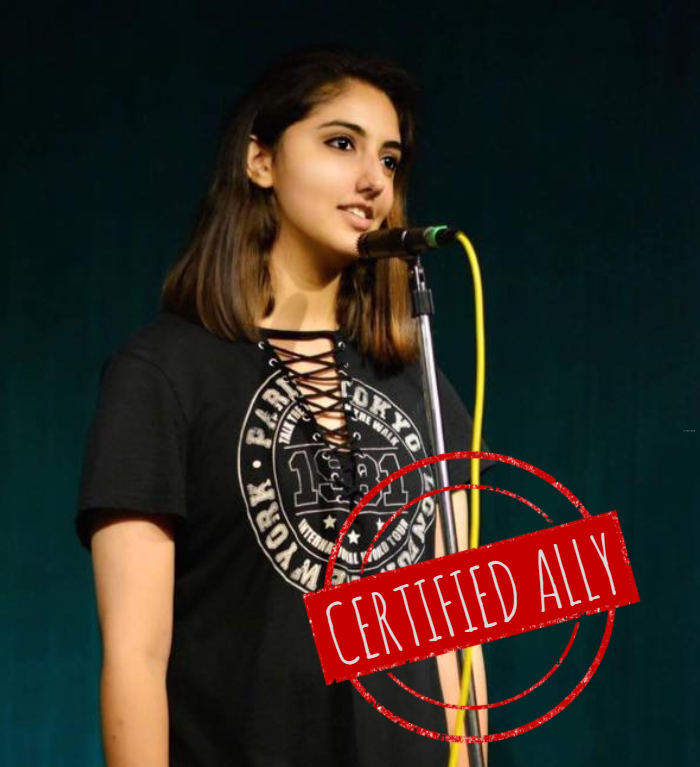 Priyal Thakkar, one of the founders of Povera, an Ahmedabad-based spoken word poetry collective, tells Priyanka Sutaria why she speaks up against gender violence. Povera is not simply a collective for words and rhyme; it is a space which encourages open dialogue and is considered by many to be safe, as well as empowering. 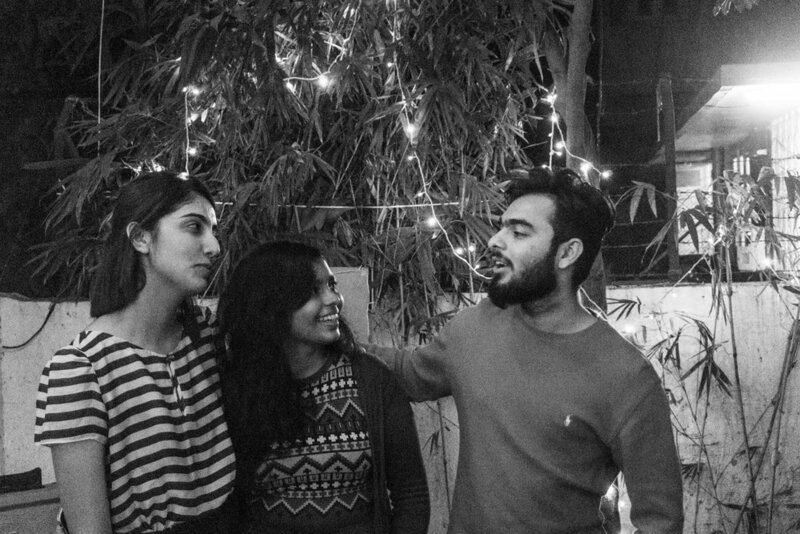 These three pillars—much like the three co-founders of the collective—uphold the spirit of what Priyal (20) feels is necessary in any healthy democratic society. Her powerful poetry, which she performs in a unique staccato manner, is packed with phrases such as “it’s okay” and “it isn’t a big deal”, which echo like self-imposed punishments, a repetitive poetic device which is woven through several poems. Along with writing about sexual violence, Priyal is invested in making a platform and a safe space for survivors of assault in Ahmedabad. PS: What does Povera stand for, according to you? PT: Povera is a space free from judgement that believes in talking through poetry, [what] people often find uncomfortable in conversations. Spoken word poetry in particular, is an instrument which can be used to both educate and empower, and since monsoon last year, Povera has tackled numerous contentious issues which deserve attention—abuse, sexual violence, mental health and menstrual hygiene, to name a few. PS: What drove you to create a space like Povera? PT: I recall when my sister confided in me about being touched inappropriately by a man in an elevator. That day, I offered her empty words of reassurance, and this finds its way into quite a few of my poems. There is a sense of guilt which comes with staying quiet, of how I ended up silencing and invalidating my sister’s pain. By staying quiet and encouraging silence, aren't we all, similarly, becoming complicit in the crime ourselves? Isn't is alarming I feel lucky I haven't been sexually violated yet; that that is an exception and not the norm? PS: You write extensively about sexual violence, as an ally. Where do you believe the poet stands as a voice against sexual violence? PT: I do not assume the identity of the victim, for I have not faced sexual assault, but instead I adopt the gaze of the ever-looming society that creates norms and conditions minds. My style of writing is geared towards making both readers and listeners uncomfortable with what they are experiencing, and and hopefully carry a piece of the poem back home within themselves. Priyal performs 'The Good Man', her powerful poem about child sexual abuse. PS: Appropriation of oppressed voices has become an important issue in the world of spoken word poetry. What are your thoughts on the issue? PT: I believe that we must not at any cost, appropriate the voices of those who have survived sexual violence; instead I take on the guise of what I know I am already complicit in—a web of patriarchy which I am compelled to speak up about in order to try and make even the tiniest difference. So when a close friend and survivor told me that expecting victims to speak up for themselves was not always the best way to initiate dialogue, I was able to understand the position of incredible privilege one must occupy to ask the person to go through the pain by recounting the experience. Similarly, when another friend asked me to write about their experience, I realised that their wish to not tell their story did not equate to a lack of desire to have their story be told. I did end up writing that poem, and I perform it to date. Enabling survivors to tell their own stories remains the first step, but it is not the only one anymore. PS: What does it mean to be an ally against gender-based violence? PT: It means that you believe that others should have the same rights you enjoy or want for yourself; [it is] the patience and respect to listen, to educate oneself, and stand up against injustice. This is a lesson we believe deserves to be carried as we move towards creating an equitable society.